King 16 oz. 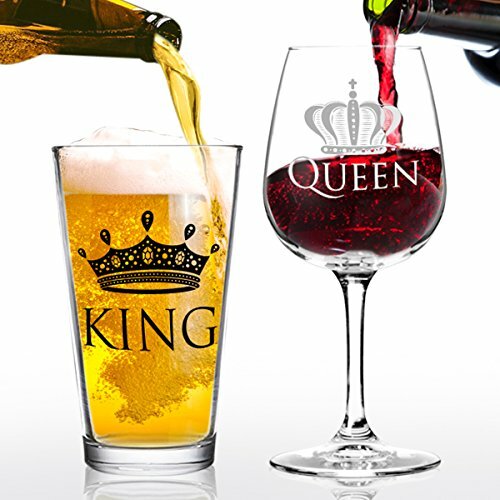 beer glass for the Mr. and Queen 12.75 oz. wine glass for the Mrs.
USA Made, designed, and printed with beautiful intricate, graphics. Vivid, large print is easy to see and won't wear off. Dishwasher safe (top rack only). Unique gift that's perfect for engagement parties, wedding, anniversary, and newlyweds, him or her, mom or dad, husband or wife. Sturdy, heavy duty gift box is safe for shipping and great for gifting!